Publications: Regional Arts Impact Australia. That's a Fact! 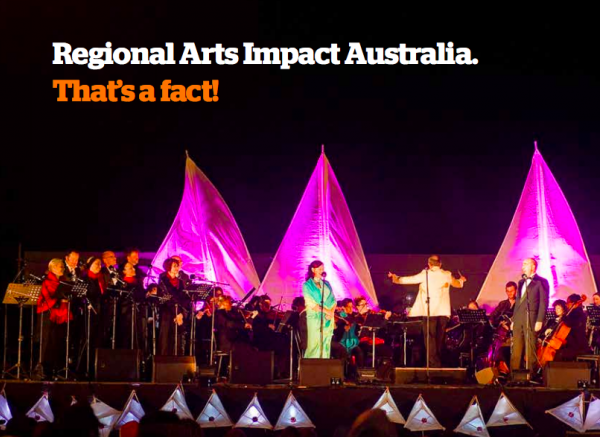 Regional Arts Impacts Australia - That's a Fact! From Albert Namatjira to Djuki Mala, Joy Hester to Gwynn Hanssen Pigott, Australian artists at the cutting edge have always sought out the regional and remote places, not because they are in the middle of nowhere, but because they are places where people feel at the centre of everything – that’s a fact! Artists and arts workers in regional and remote places use art and culture to build strong communities, generate jobs, reimagine places and build innovative infrastructure. One in three people in Australia live in regional and remote places and their arts and cultural contributions have a national impact. Culture comes from place; it is an important part of creating communities. Regional arts link people to broader community life through economic opportunities, improved quality of life and social connection.